*NOTE: One of America's best-known composers of Christian liturgical music was scheduled to visit St. Scholastica in November for a concert, retreat and prayer service, but the event was postponed due to a winter storm. Details on the rescheduling of these events will be shared as they become available. David Haas will conduct a concert, workshop and prayer service. The events are open to the public. Haas will perform a concert at 7:30 p.m. Friday, Nov. 18 in the Mitchell Auditorium on campus. A free-will offering will be taken, and Haas' CDs and books will be available for purchase in the auditorium foyer before and after the concert. A reception will follow the concert. On Saturday, Nov. 19, Haas will offer a workshop entitled, "Blest Are They Who Show Mercy" from 9:30 a.m. to 2:30 p.m. in Our Lady Queen of Peace Chapel on the St. Scholastica campus, The cost is $35, which includes lunch. The registration deadline is Nov. 12. To register, email bkaiser1@css.edu or call CSS Campus Ministry at 218-723-5933. To celebrate the closing of the Year of Mercy, Haas will lead a Taizé Prayer service at 7:30 p.m. Saturday, Nov. 19 in Our Lady Queen of Peace Chapel. Taizé Worship includes music, scripture, silence, meditation, and prayer. It is modeled after the worship services at the Taizé Community in France. Haas is from Eagan, MN, where he is the director of The Emmaus Center for Music, Prayer and Ministry, in addition to serving as Animator for the Taizé Prayer Community at Cretin-Derham Hall in St. Paul, MN. 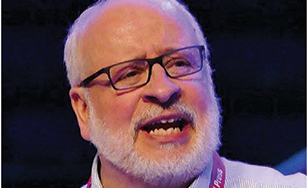 Highly regarded as one of the pre-eminent composers of liturgical music in the English-speaking world, he has produced and published more than 50 collections and recordings with GIA Publications. His music has been translated into many languages and appears in hymnals of various Christian denominations throughout the world. Haas' most recent music collections and recordings with GIA include: "The Rosary With St. James," "I Will Live On," and "God Is Everywhere!" In 1991 he was nominated for a Grammy Award for "I Shall See God" (GIA). He is the founder and executive director for Music Ministry Alive!, an international liturgical music formation institute for high school and college-age youth, and has traveled extensively as a workshop presenter and concert performer in all 50 states, as well as Canada, Australia, England, Ireland, Germany, Italy, Israel, Greece and Turkey. He is the author of more than 25 books in the areas of liturgy, religious education, youth ministry and spirituality. The events are co-sponsored by CSS Campus Ministry, St. Scholastica Monastery and the Braegelman Program of Catholic Studies. For more information contact Beth Kaiser at bkaiser1@css.edu or call CSS Campus Ministry at 218-723-5933.